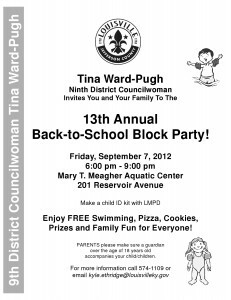 Ninth District Councilwoman Tina Ward-Pugh invites everyone from Irish Hill to the Annual Back-to-School Block Party. Take a look! 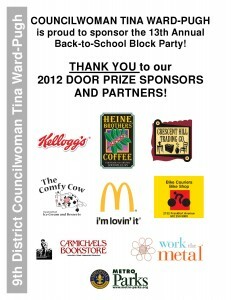 The Irish Hill Neighborhood Association in honored to partner with these companies who are helping bring the Roots Fest in Irish Hill together. 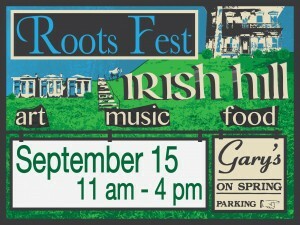 Come down and groove to the First Annual RootsFest in Irish Hill. Live local music is on deck with the Appalachian-Latin fusion band, Appalatin along with Louisville Blues, Blues Chasers and old school bluegrass group, Bluegrass Messengers. 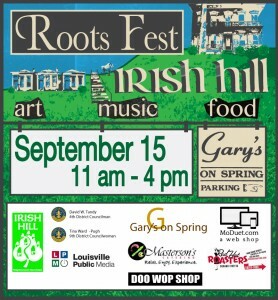 There will be fun for everyone including Local Art & Craft, Kids Craft Tent, Delicious Food from Gary’s on Spring, Four Roses Bourbon Tasting & Craft Beer. Bring your lawn chair, the kids, the grandparents, your in-laws and your SHOES because funds raised will benefit WaterStep, formerly Edge Outreach. WaterStep trains individuals and organizations to provide safe drinking water to people in developing countries. Shoes, not just for dancing anymore, though it will be encouraged.